Dave Frecklington was “delighted” as Spalding United completed a derby double over Stamford. 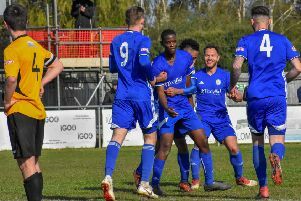 The Tulips took top spot in the Evo-Stik Northern Premier League First Division South with a fifth successive win as morning leaders Shaw Lane saw their game frozen off. For the second time this season, Spalding came from behind to beat the Daniels 2-1. Frecklington said: “I thought they started the first half a lot better than us. “Graham Drury got the team selection right. You can tell what they are trying to do here as he’s getting to know the league where you must be big and strong. “For long spells in the first half, they were the better team. We knew we would go top if we won and hopefully we can kick on now. “They scored a good goal but we got level again and then we can grind down teams with the way we play. “We don’t get a lot of credit for what we do. “A lot of teams are questioning how we are top of the league but that’s brilliant - we love it! Bradley Wells cancelled out Jamie McGhee’s opener before the break and Jordan Lemon made it 2-1 with 15 minutes left. Frecklington added: “Our winning goal was absolutely top class. “Lemon ran 80 yards, Brad Barraclough slotted him in and at any level that’s a good finish. “Once we got in front, we saw the game out and ran down the clock. “We knew we would go top if we won and hopefully we can kick on now. “Drury is a good manager so doing the double over Stamford in my first season at Spalding is massive. “They are a big club who can beat a lot of teams in this league. “In the second half, we were the better team. The keeper made a world-class save and that shows we were on the front foot. “Sam Vince came into a pressure game and did the basics right with his catching, punching, kicking and distribution.